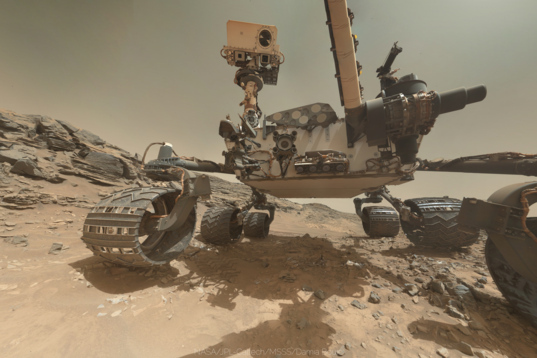 Whenever Curiosity drills at a new site on Mars, the team tries to take a self-portrait as part of the documentation of the drill site. On sol 1065, Curiosity took its most recent self-portrait -- from a brand-new perspective. It's fun. But why this different point of view from previous panoramas? And were there any special challenges in making it? I talked with both the rover driver who headed up the development of the arm sequence (Joseph Carsten) and engineers and scientists who developed the camera (Mike Ravine and Ken Edgett) to learn more about this special self-portrait. 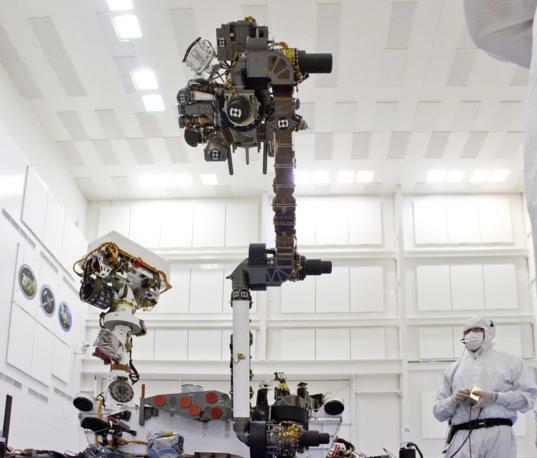 MAHLI is one of four color cameras on Curiosity; the other three, including the Mastcams and Mars Descent Imager or MARDI, were also built at Malin Space Science Systems. (In mission documents they're referred to together as the MMM cameras for MAHLI, Mastcam, and MARDI.) All three cameras have a common detector and focus mechanism, but different optics. Ravine told me that the story began about a month before Curiosity's launch. In a conversation among three MMM camera team members, including Ravine, Mastcam/MARDI principal investigator Mike Malin, and filmmaker James Cameron, the men realized that MAHLI had the potential to take some of the most evocative photos of the mission. It has a wider-angle view than the Mastcams, but more importantly, it could be pointed back at the rover to image rover hardware on Mars. Of course, this was not the original intent of MAHLI, and it would take significant effort to pull off. A self-portrait would require dozens of MAHLI photos that would have to be stitched together on the ground. For them to stitch together seamlessly, the camera's detector needed to be held at a fixed position in space, while the optical axis was rotated to point in all the different directions required for all the images. It could be done, but using MAHLI is a lot more complicated than using the Mastcams. The Mastcams sit on a camera bar that points using a pan and tilt mechanism that is comparatively simple to understand; Mastcam image sequences can be developed by Mastcam team members based at Malin Space Science Systems in San Diego. But MAHLI sits on the robotic arm, and only skilled rover drivers -- officially titled "rover planners" or RPs -- at the Jet Propulsion Laboratory can develop robotic arm sequences. In fact, only some rover drivers are qualified to work the arm. So the MMM team had to get the rover drivers on board with the idea. 1) Make sure everything you want to image is covered with adequate overlap between frames. 2) Minimize the total number of frames required (save on duration and data volume). 3) Simplify the sequencing as much as possible to reduce the review burden on the tactical team. This process is complicated by the fact that not every position and orientation is guaranteed to be reachable. One factor is collisions. There can be collisions between arm and rover hardware. Another factor is kinematic reachability. A desired position may not be kinematically feasible at all, or it may only be reachable in a specific arm configuration. When we run the observation, we actually capture all the frames that are reachable in one shoulder configuration, switch the shoulder configuration (which takes a few minutes), and then take the rest of the frames in that other configuration. There are other secondary considerations as well. One is lighting. Ideally you don't want shadows to move much between frames so the stitching works well. For that you can play with the time of day for the observation and the ordering of frames (take spatially adjacent frames close together in time so the shadows don't have much time to move). For these mosaics, the shadowing you'd really like to avoid is from the arm. Since the arm moves between each and every frame, the arm shadows move more dramatically than anything else. Nothing can ever be done with the robotic arm on Mars unless it has been tried out first on the testbed rover on Earth. 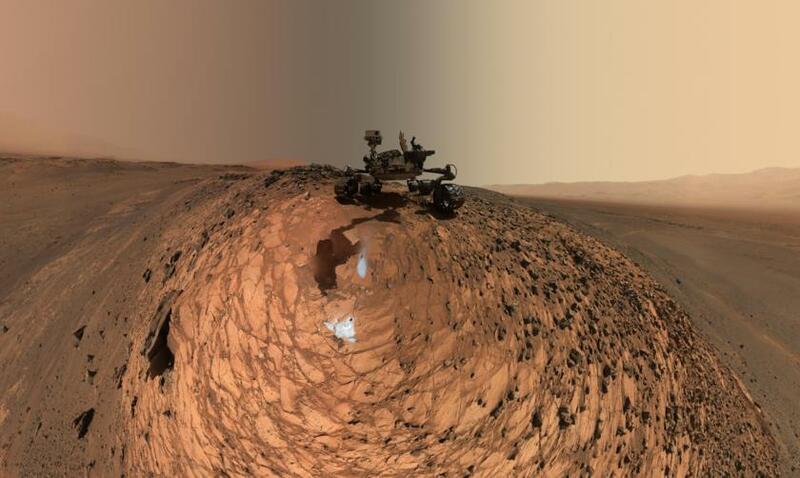 If Curiosity was going to shoot self-portraits on Mars, its double would have to shoot a self-portrait on Earth first. 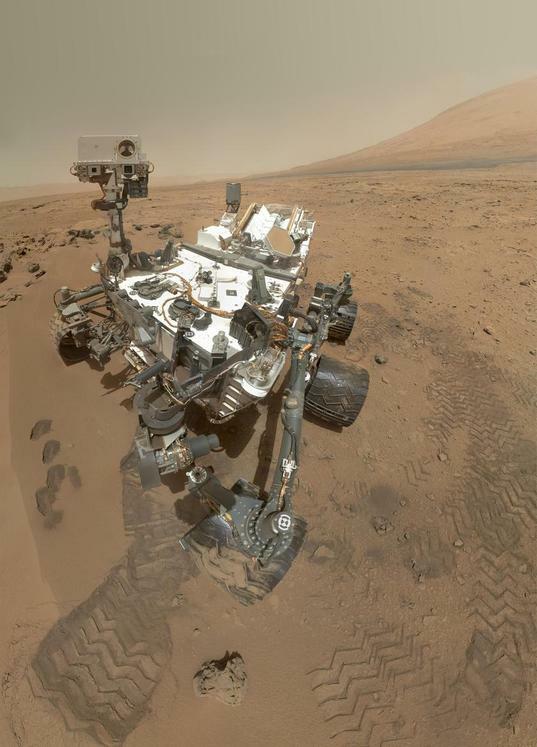 But as Curiosity sped toward Mars, the rover drivers were preoccupied with more important things than selfies, such as testing out all the arm sequences that would allow them to do critically important science tasks, like positioning APXS and MAHLI on a rock target, and the terribly complicated process of drilling. There was an awful lot of verification and validation to be done in the time between launch and landing. Once the rover landed, the engineers would need to use the testbed rover to mirror Curiosity's actual motions on Mars during its initial shakedown, so it would not be available for testing purposes for weeks after landing. Testing in the outdoor Mars Yard would have to end on August 1, 2012 so that the testbed rover could be driven across JPL to the indoor Mars yard for mission shadowing after landing. Ravine told me that as August approached, he figured that the rover drivers wouldn't have time to test out the sequence. Early in the morning of August 1, Ravine got an email: they had run the test. Ravine pointed out to me that in the image below, you can see the clock on the wall shows 4:30. That's not 4:30 PM, it's 4:30 AM (a fact confirmed to me by Vandi Verma, one of the two engineers in the picture). It was actually the very last thing they did with the testbed rover before they drove it to the indoor Mars yard. They shot the mosaic twice in two slightly different positions, allowing the possibility of a 3D self-portrait. Camera and robotic-arm maneuvers for taking a self-portrait of the NASA Curiosity rover on Mars were checked first by the Vehicle System Test Bed (VSTB) rover, a test unit located in the Mars Yard at the Jet Propulsion Laboratory. The team was thrilled with the image and looked forward to running it on Mars. James Cameron predicted that, if successful, it would be printed on every magazine cover. He also pointed out that the image was not yet perfect for a magazine cover, because it couldn't be cropped to a rectangle without truncating the left front wheel, so later on Carsten added more frames to fill in the lower corners. They took the first full self-portrait on Mars on sol 84. An amazing color self-portrait photo of Curiosity standing on Mars, on sol 84 (October 31, 2012). The photo is a mosaic of images shot with MAHLI, the camera on the end of the robotic arm. Although MAHLI is mostly intended as a tool for viewing soil and rocks up close at microscopic resolution, it can focus out to infinity so can be used to photograph things at any distance. Sol 84 wasn't the first time that MAHLI imaged the rover. 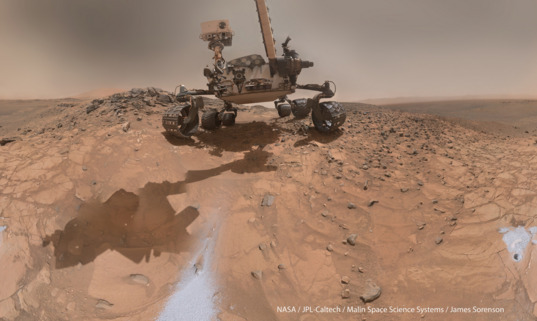 Much earlier than the vanity project of the full self-portrait, the rover drivers wanted to use MAHLI for an engineering purpose, to image key parts of Curiosity's hardware to check out how it had survived the landing, like the mast. One of the earliest MAHLI sequences was this "belly pan," checking out the undercarriage of the rover. On sol 34 (September 9, 2012), Curiosity made the first use of her MAHLI arm-mounted camera to take a good look at her wheels and her four Hazcams. The sequence for the belly pan was generated by the rover drivers at JPL without consultation with the MAHLI science team -- ordinary procedure when an image is being taken for engineering purposes. The rover drivers didn't need the images to mosaic together so they didn't go to the additional trouble of holding the camera position constant between images. The images don't fit together neatly; the seams in this mosaic are jarring, and parts are out of focus. But people loved the rover's self-portrait of its wheels on Martian soil. When Ravine saw the belly pan as a foldout in the a National Geographic article in July 2013, he knew it could be done seamlessly, like the sol 84 self-portrait, and he thought it would be worth the attempt. He suggested it to the team, and just three weeks later, the rover planners ran the sequence in the testbed, validating it for use on Mars. 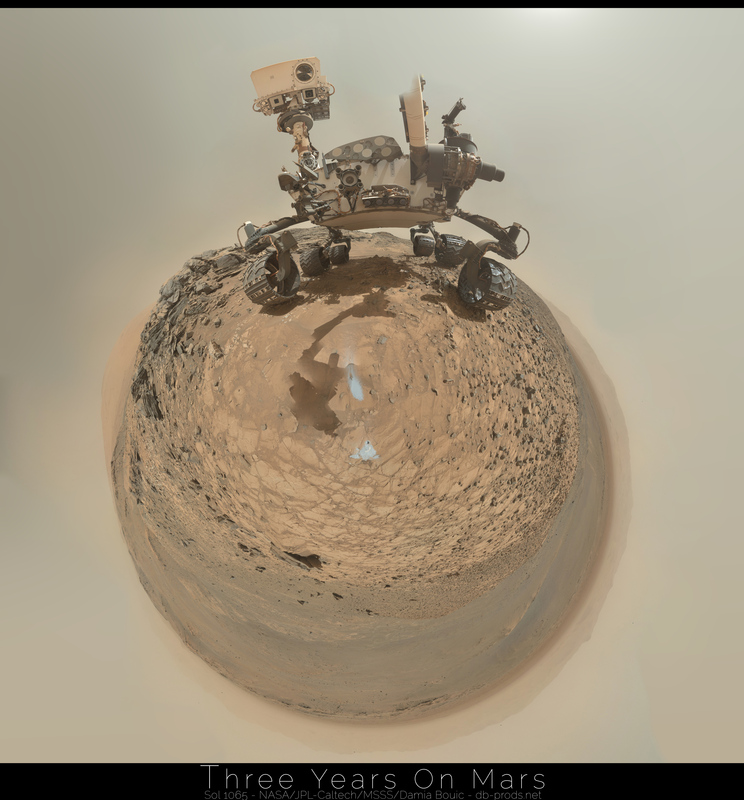 Not only had they captured a seamless belly panorama, they photographed the entire rover from the same point of view. All sequences involving Curiosity's robotic arm must be tested with the Virtual System Testbed (VSTB, nicknamed "Maggie") before being run on Mars. 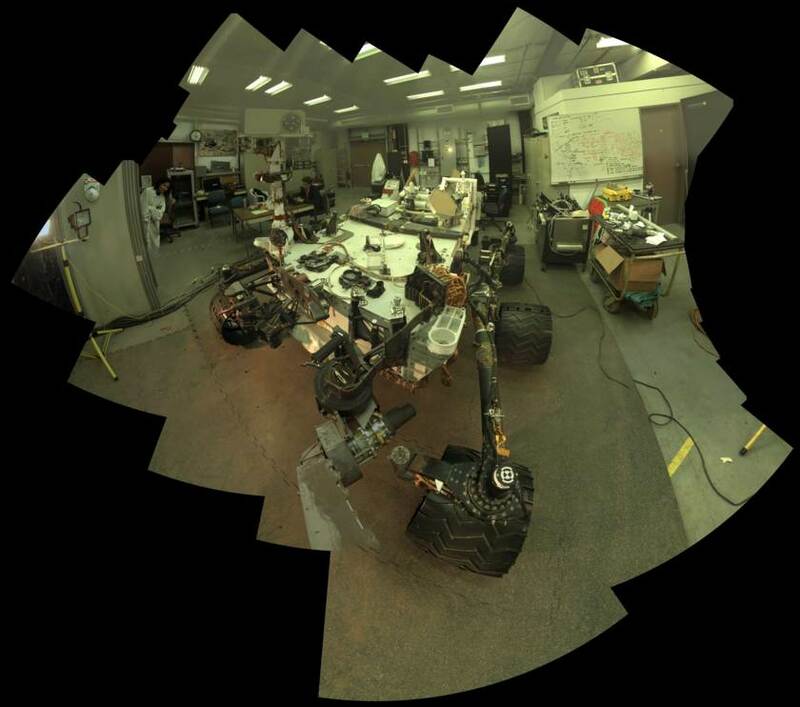 This is a test of the 360-degree panorama inspired by Curiosity's sol-34 "belly pan", performed on July 30, 2013. The sequence was eventually run on Mars on sol 1065 (August 5, 2015). The seated engineer is Joseph Carsten, the rover planner who developed the Curiosity self-portrait arm sequences. This photo was taken during testing at the Jet Propulsion Laboratory on June 3, 2011 at NASA's Jet Propulsion Laboratory. The turret at the end of Curiosity's robotic arm holds five devices. In this view, the drill is at the six o'clock position. The next device clockwise is the Collection and Handling for In-situ Martian Rock Analysis device, or CHIMRA. It includes a soil scoop and a set of chambers and labyrinths for sieving, sorting and portioning samples of rock powder or soil for delivery to analytical instruments. At the 10 o'clock position is the Alpha Particle X-ray Spectrometer (APXS). Behind the forearm are the Mars Hand Lens Imager (MAHLI) and the Dust Removal Tool (DRT). All told, the turret alone weighs 34 kilograms -- three times more than the total mass of the first Mars rover, Sojourner (11.5 kg). For the regular selfie we used one focus setting for the whole thing. For this one we had a wider range of distances to objects in the scene (~60cm to some of the workspace out to infinity on the horizon). We ended up using two focus settings - a closer focus for the workspace and a further focus for everything else. Building the commands to implement the activity is an iterative process where you try and satisfy all the above constraints (some of which can be at odds with each other!). The sheer number of imaging positions makes things interesting. As you try and tweak things to solve one problem, you don't want to break everything else that's already working. When I saw where we ended up for the latest drill campaign I suggested that maybe this was the place to finally do [the belly-pan self-portrait]. The rover was in a fairly unusual place, perched right on the edge of the top of a hill. The workspace was sloping away from the rover, which isn't very common (and makes target reachability difficult!). However, it's great for the belly pan because there is extra clearance between the turret and the terrain. We were actually able to get a lower viewing angle than originally planned because of that. Plus there's the amazing sweeping view of the valley in front of the rover and the interesting fairly tall chunk of outcrop just off the starboard side of the rover. For all of those reasons it seemed like a fantastic place to do it, so I'm glad we were able to fit it in before we left! I am, too! And it's been fun to watch the amateur community try to make the best of it. Since the image is essentially spherical, it's a challenge to represent the result on a two-dimensional screen; many amateurs have grappled with this image, and each has tried their own way of solving the problem. It can work to crop a small area, but then you miss the expansive view. You can recognize that all of the ground surface is essentially the bottom half of a sphere, and represent that as a circle; but Curiosity's head balloons. You can accept ballooning in areas of the panorama where scale is less obvious. You can view it with an application designed for photo spheres. In the official vision, the projection treats the ground more or less as a sphere, but it's sliced in a way that distorts the rover less at the cost of introducing more distortion in the terrain. It doesn't matter; it's beautiful. I'm glad for the people on the mission who had the imagination to see the potential for these self-portraits -- and the persistence to pull them off. Thanks to everyone involved! Thanks for sharing. It's interesting how the arm doesn't show. What a great value for humanity, operating many times longer than originally planned. I just visited Craters of the Moon National Monument and met a team of NASA folks. They were determining how similar this volcanic area of Idaho is to the surface of Mars as a potential practice area. During the Apollo program, astronauts learned about moon geology here. I wonder if they've ever considered putting a portable "makeup mirror" on a rover. Use the arm to set the mirror on the ground, back off and take high-res selfies through the mirror. Retrieve the mirror for future selfies. Might be useful for assessing the health of the spacecraft.